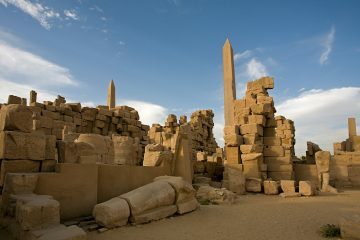 – the pyramids, the tomb strewn Valley of the Kings, Abu Simbel and a relaxing cruise, meandering the River Nile onboard a five star Nile Cruiser. After your early morning check out from the hotel, your tour leader will meet you at the hotel in Cairo for your transfer to Cairo Airport for your domestic flight to Aswan. 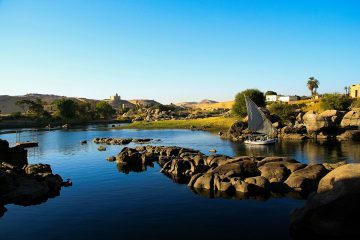 Upon arrival to Aswan Airport and after the baggage area you will find a representative waiting for you to transfer you to your Nile Cruise Ship. Upon arrival to the Nile Cruise, your tour manager will arrange a time to sit down with you and go through your schedule whilst on the Nile Cruise. After check in make your way to your cabin, refresh and relax on board the boat for the rest of the day, taking in the views of the local culture from the top deck. Enjoy your breakfast on board the Nile Cruise; the Egyptologist will accompany you to a horse-drawn carriage or bus for your visit to the popular Ptolemaic Temple of Horus at Edfu, otherwise known as Edfu Temple. Shortly the Nile Cruise will continue its sail to Esna and continue through the Esna lock. Here you can watch the local workers doing their best to get the boats through the lock as quickly as possible. After Esna lock the Nile Cruise will sail to Luxor to arrive early evening. After breakfast you will check out of the Nile Cruise, breakfast will be slightly earlier than usual today, as we want to take advantage of the beautiful early morning to visit some of the fascinating sites available on the West Bank of the Nile River in Luxor. After breakfast your qualified Egyptologist will be waiting in reception for you to start his tour. You will sample the relaxing journey over the famous modern bridge in Luxor which now connects the East and West Banks. Depending on how the Egyptologist plans the morning you will usually visit the Colossi of Memnon, are two massive stone statues of Pharaoh Amenhotep III. Followed by the amazing Valley of the Kings, which was built inside the mountains and away from the city to ensure that the Pharaohs had each, their own secret burial chamber. Here you will be able to visit 3 of the tombs as advised by your Egyptologist. You will then move along to Hatshepsut Temple, dedicated to the sun god Amon-Ra and is located next to the mortuary temple of Mentuhotep II which was built by Queen Hatshepsut, daughter of Thutmosis I, who ruled Egypt about 20 years during the 18th Dynasty. After visiting the sites you will return to the Nile Cruise to collect your luggage and continue with your return journey. Your transfer rep will collect you from the Nile Cruise for your transfer to Luxor Airport for your domestic/internal flight to Cairo. Upon arrival to Cairo Airport your tour leader will meet you and guide you through the airport formalities. Your tour leader will accompany you on your transfer in a private modern air conditioned vehicle for your overnight stay in Cairo. After breakfast, usually you have some free time to enjoy your last remaining hours in Cairo before your flight. It is customary to check out of your room at 12 noon however you will be able to use the hotel facilities until you leave for the airport. 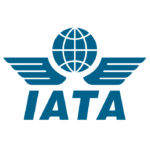 At the agreed time your tour leader will come to collect you from the hotel and transfer you to Cairo International Airport for your departing flight. Please note check-in at hotel is available from 2pm. Please note that check-out at hotel is 12 noon (Hotel). Nile Cruise check-in is usually around lunchtime. Nile Cruise boats sometimes require an early morning check out. A witness of the significant architecture of Ancient Egypt and has had a significant impact on the economy and culture of Egypt. The High Dam, situated across the Nile River in Aswan,was constructed between 1960 and 1970 to control floods, provide water for irrigation, and generate hydroelectricity were seen as pivotal to Egypt’s industrialisation.The Dam is 11,811 feet long, 3215 feet thick at the base and and 364 feet tall. As a result of its construction, a great lake was formed, Lake Nasser, which is about 10 km wide in some places, and 500km long, extending between Egypt and Sudan. 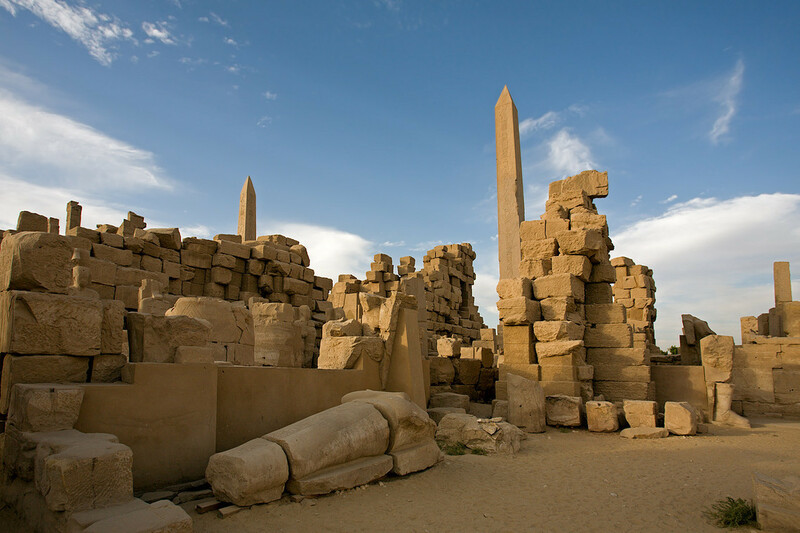 It is an unusual double temple built during the Ptolemaic dynasty in the Egyptian town of KomOmbo. Some additions to it were later made during the Roman period. The building is unique because its ‘double’ design meant that there were courts, halls, sanctuaries and rooms duplicated for two sets of gods. The southern half of the temple was dedicated to the crocodile god Sobek, god of fertility and creator of the world with Hathor and Khonsu. Meanwhile, the northern part of the temple was dedicated to the falcon god Haroeris, also known as Horus the Elder. It is remarkable for the beauty of its site and the magnificence of its architecture. It was built of red sandstone, and its portico consisted of six rows of four columns each, with lotus-leaf capitals, all of which however differ from each other. This Temple conveys a sense of the importance which the Ancient Egyptians placed upon their places of worship. Great tour guides, excellent value, a holiday I won’t forget. Thank you for the memorable photos and your expert delivery on all things. We will have fond memories of our time.